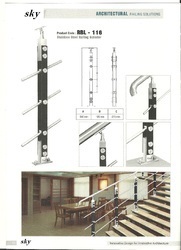 Being one of the reputed organizations in the market, we are engaged in manufacturing and supplying an exclusive range of SS Railing Wood Baluster. Our skilled professionals make use of optimum quality wood and supreme quality stainless steel which is well furnished and polished simultaneously. These balusters are comprised of wood and steel that enhances the beauty of railing. 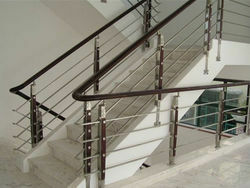 Our balusters can be availed from us at nominal prices. 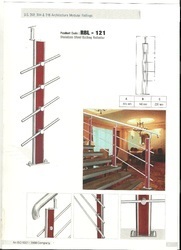 We offer stainless steel railings with various combinations of SS & Wooden., Various SS & Wooden Balustrades that we offer are available in different sizes and shapes. 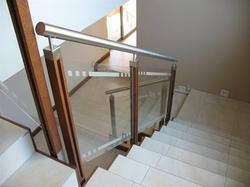 Customer can avail these balustrades in an affordable price. Quality being the prime concern, we offer varied range of Stainless Steel Wood Balustrade that are quality assured in nature and have high strength. We offer them in different attractive patterns and finishing and are delivered in well-defined time. These products are corrosion resistant in nature and are delivered as per the exact preferences of our clients. We are counted amongst the reckoned names in the industry, offering attractively designed range of Stainless Steel Wood Balustrade that re durable in nature and are corrosion resistant. Our entire product range have high strength ad Rae delivered in varied specifications. We deliver them in well-defined time frame thereby rendering utmost client satisfaction.